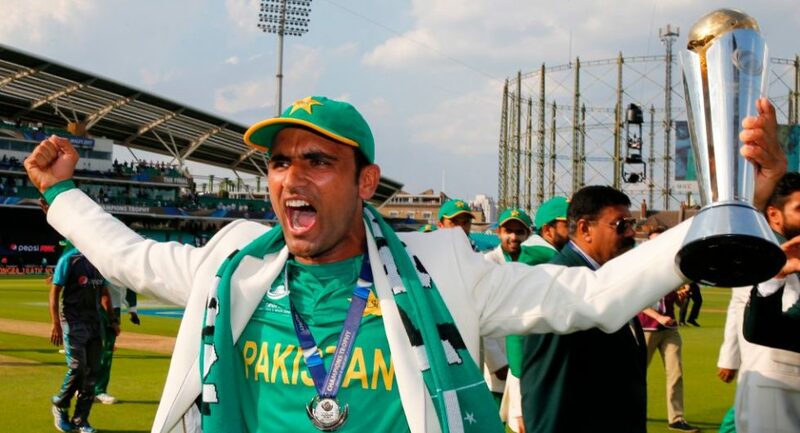 Fakhar Zaman is a Pakistani cricketer. He is single Pakistani cricketer who has made the double century in ODI cricket. He has the record of highest ODI score in Pakistan and third highest in the world. Zaman plays as an opener batsman. 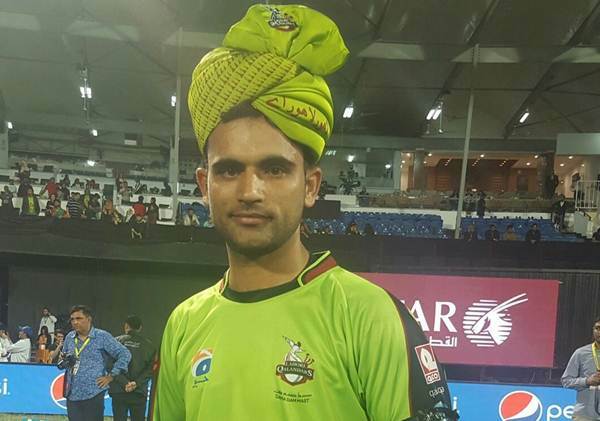 Here you can read about Fakhar Zaman Biography, Records, Cricket Career and all things you want to know. you have read above Fakhar Zaman Biography now, read bellow Fakhar Zaman Cricket Career. With 297 runs in Five matches at an average of 59.40. Fakhar Zaman took the second position in the list of the highest run scorer in Pakistan Cup 2016. This included Two half-centuries & One Century. Fakhar Zaman scores 650 runs in the Quaid-e-Azam Trophy season 2016 averaging 54.16. While chasing a tricky total of 211 against England in ICC Champions Trophy 2017. Zaman along with Azhar Ali constructed a 118 runs partnership. This partnership was incidentally the highest opening stand for Pakistan. In the history of Champions Trophy. On 20 July 2018, he became the first batsman for Pakistan. To score a double century in a One Day International (ODI) match. Two days later, he became the fastest batsman to score 1,000 runs in ODIs. Zaman was born on 10 April 1990 in Katlang in the Mardan District of Khyber Pakhtunkhwa. He moved to Karachi at the age of 16 following matriculation. In 2007. Zaman joined the Pakistan Navy as a sailor. After receiving his schooling. Training at sea from the Pakistan Navy School, Bahadur. The name Fakhar literally translates to “pride”. Amongst his teammates. He is known by the nickname fauji (soldier). In Karachi, he continued playing cricket occasionally in inter-departmental matches. Including representations for the Pakistan Navy cricket team. In 2013, he left his naval career after a “tough decision” in pursuit of this dream. Began appearing for regional outfits like KPK, Abbottabad Falcons. Balochistan and several Karachi teams. He was also picked by the Lahore Qalandars side for the PSL 2017. Where he was closely mentored by New Zealand player Brendon McCullum. In August 2017, he was named in Durban Qalandars’ squad. For the first season of the T20 Global League. However, in October 2017, Cricket South Africa postponed the tournament until November 2018. In March 2017, he was named in Pakistan’s limited overs squad for their matches. Against the West Indies. He made his Twenty20 International (T20I) debut for Pakistan. Against the West Indies on 30 March 2017. In April 2017, he was named in Pakistan’s ODI squad for the 2017 ICC Champions Trophy. He made his ODI debut for Pakistan against. South Africa in the Champions Trophy on 7 June 2017. Scoring 31 runs. In the final against India, Zaman edged to the wicket-keeper, when he was on 3. But survived as it was a no-ball. After that, Zaman went on to score his maiden ODI century and helped Pakistan post a total of 338. With that, Zaman became the first batsman for Pakistan to score a century in an ICC event final. India batting second collapsed and Pakistan won the match. By 180 runs to become the winners of Champions Trophy for the first time. In April 2018, he was named in Pakistan’s Test squad for their tours to Ireland and England in May 2018, but he did not play. On 8 July 2018, Fakhar scored 91 runs against Australia in the tri-series final in Harare to help Pakistan secure the title. He was named the man of the final and man of the series. During his innings, he also became the first Pakistani batsman to score 500 or more runs in T20Is in a calendar year. On 20 July 2018, in the fourth ODI against Zimbabwe. He became the first batsman for Pakistan to score a double century in ODIs, finishing 210 not out. In the same match, he and Imam-ul-Haq made the highest opening partnership in ODI’s, scoring 304 runs. His innings propelled Pakistan’s total to 399. Which was their highest score in ODI’s. Two days later, in the fifth match of the series. Zaman became the fastest player to score 1,000 runs in ODIs. He reached the milestone in 18 innings. Beating the previous record of 21 innings, held by five other batsmen. Zaman’s went on to score 85 runs in the match. Bringing his total to 515 runs in the series, the most by a Pakistan batsman in a bilateral ODI series. Fakhar Zaman and Imam had scored 705 runs together across the series, the most by a pair in a bilateral ODI series. Zaman also recorded the most runs scored by a batsman between two dismissals in ODIs, with 455. Above you have read about the Fakhar Zaman Biography, Fakhar Zaman Career his cricket history, Fakhar Zaman records. and much more bellow is its conclusion. 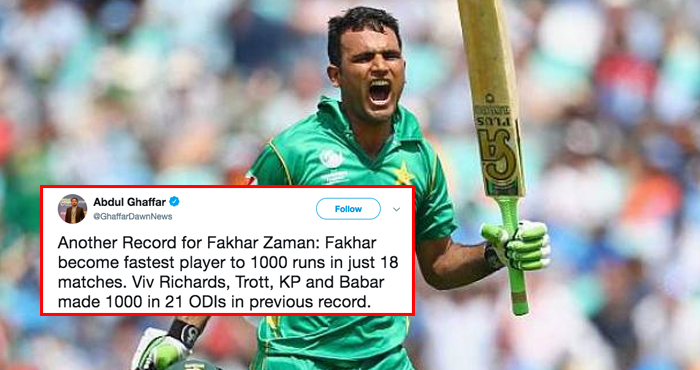 Fakhar Zaman is one of the best players in the history of Pakistan Cricket team. Team expecting to him for more better performances to him. Pakistani selecting committee tries to search more Fakhar Zaman’s into the Pakistani nation. As a Trial base or Trial hunting programs. With the strong Batting lineup Pakistan set-up their outstanding Opening and middle order Batsmen. Even Bowlers also played well like Shadab Khan, Faheem Ashraf, Hasan Ali. Mohammad Amir & Mohammad Nawaz. Not only Pakistani nation but also the whole world. Cricketer lovers appreciate Zaman’s performances and hard work. Everyone expecting to Zaman’s for more record broker. But it’s possible if he will try to hard work. If he’ll lazy so maybe he’ll not achieve other records.